Huge List of 132 Smartphone Apps That Really Pay You Money! 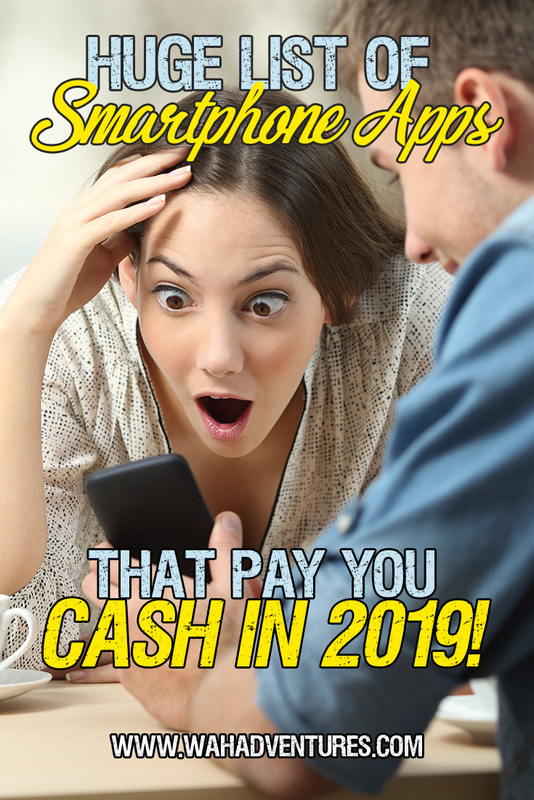 You are here: Home / Extra Cash / Smart Phone Apps / Huge List of 132 Android and iPhone Apps That Really Pay You Money! There are so many legit apps that pay you just for using your smartphone! No matter what you like to do – exercise, watch TV, take surveys, shop – there likely is an app for your iPhone or Android phone that will pay you to do what you enjoy. It can be difficult sorting out legit apps from scams, though. But, that’s what this huge list is for. I did the hard work so you don’t have to! Every app on this list does pay, so you won’t have to waste your valuable time. And, they’re all available for either operating system, unless otherwise indicated. Download Legit Android and iPhone Apps That Pay You Real Money! Before you get started with downloading these apps that pay you to lose weight, watch ads, and more, consider getting a PayPal account if you don’t have one yet! Most of these apps pay quickly with PayPal, and it’s completely free to sign up. These rewards apps pay you for so many different things, you’ll never get tired of earning cash! SwagBucks (review) – Through the SwagBucks app, you can do all the things you love to do on the website, like shop your favorite retailers, play games, and take surveys for SwagBucks. Redeem your SBs for gift cards, prizes, or PayPal cash. InboxDollars (review) – The popular rewards site is also available for your smartphone! Surf the web, play games, read paid e-mails, and take surveys to earn money, which you can redeem for cash. Cash Pirate – Cash Pirate is a fun mobile app that helps you earn money or gift cards for playing games, downloading apps, completing offers, etc. CashKarma – Install this app and you’ll get your first 300 points. You can then take surveys, complete offers, and do bonus tasks for extra points, which you can redeem for cash or gift cards. EarningStation – This site and app come from the makers of InboxDollars, another incredible rewards site. EarningStation has paid surveys, games, videos, and more. GrabPoints – GrabPoints has tons of ways to earn some cash, including cash back offers for shopping, downloading apps, and more. Earn points which are redeemable for PayPal cash and gift cards. Instant Rewards – Complete a variety of tasks through the app, like “liking” Facebook pages or watching ads, to earn cash. You can also receive 10% of the lifetime earnings of your referrals! Juno Wallet – Play games, make calls, invite your friends, and more, to cash in on real cash with Juno Wallet. MintCoins – MintCoints pays you to download apps, take surveys, and a variety of other smartphone tasks through its app. mPlus Places – Take your mPoints on the go with its app, which lets you earn points for checking the weather, tracking your exercise, and more every day tasks you do with your smartphone. You can redeem your points for gift cards from major retailers, like Amazon. MooCash – Watch videos, invite your friends, play games, and do other tasks to win MooCash, which you can exchange for things like Bitcoin and Amazon gift cards. Panel App – Earn points in a variety of ways through Panel App. You can also earn more by referring friends and get 10% of everything they earn! Redeem your points for gift cards and other prizes. Perk – Check into your favorite places, take surveys, and watch videos to earn cash through the Perk app. You can win prizes daily and earn cash via Perk Plastik. Rewardable – Rewardable has the usual – offers, surveys, and videos – plus other fun ways to earn gift cards to your favorite places. Tapporo – Watch advertisements and complete free and paid offers to earn PayPal cash, Facebook credits, and other fun rewards on the go. You can get paid with these apps for taking surveys, providing your valuable feedback to companies who need it. These highest paying apps work in much the same way as the web-based survey taking websites that pay money. MySurvey (review) – One of the oldest survey sites around, MySurvey also has a mobile app that helps you take its surveys even when you’re not home. Pinecone Research (review) – Pinecone Research is one of the best-paying survey sites, paying $3 per survey! Download its app and you’ll be able to take its surveys whenever you want. Toluna (review) – Popular survey site, Toluna, now has a mobile app, available in 13 languages, to take surveys on the go. You can exchange your points for PayPal cash. American Consumer Opinion – This survey site doesn’t have an actual mobile app, but it does have a very mobile-friendly site that turns into an app when you browse it from your smartphone or tablet. iPoll (review)– Answer surveys through the mobile app and get rewarded with gift cards or PayPal cash. 1Q – 1Q helps companies learn what their customers are thinking. The app sends you questions via text message or through the app, and you’ll get $0.50 for each answered question. Pays instantly to your PayPal account. Log in, take surveys, and start making points for your opinions. Every point equals a penny earned. Curious Cat – This survey app offers only rewards in PayPal, so you must be eligible for an account to be able to use it and get paid. Google Opinion Rewards (Only for Google Play)– Google’s Opinion Rewards app sends you quick surveys to your smartphone. You’ll get paid with Google Play credits, which you can redeem for anything in the Google Play store. gRateFriends – Rate and answer questions about businesses that you visit and earn money. You can also earn more by inviting your friends to join your “team”, and earn $30 just for referring a business to the app! IdeaShifters – IdeaShifters sends you surveys, depending on your location, that relate to businesses in the area, and pays you for your time. Mindswarms – Use your phone to complete video surveys with Mindswarms! This app pays up to $50 per survey, which are only seven questions or less, and you get to talk on video to complete them instead of filling out an online survey. Panel App – Earn points for taking surveys and referring your friends using the Panel App, and then redeem them for gift cards. PanelPlace – Join PanelPlace for free and the panel will match you with the best surveys according to your interests. PointClub – Get $5 just for joining PointClub (it’s free!) and earn points for all the surveys you take on the website or the app. Qmee – I have Qmee listed down below as a shopping app, but it also lets you make money by taking surveys when you’re not shopping online. You can cash out whenever you want! Quick Thoughts – If you like sharing your thoughts, download the Quick Thoughts app, which pays you to answer questions on products and services you use. Survey Mini – Survey Mini tracks your location and provides you with quick surveys of no more than 11 questions after you visit your favorite stores, restaurants, and other locations. Redeem your points for gift cards. Surveys On The Go – Surveys On The Go pays you in PayPal cash, rather than points, for the mobile surveys you take. The Panel Station – You can earn money, online coupons, and more for taking surveys through The Panel Station’s app. Video Chat Network – Video Chat Network is a bit different than other survey apps, in that you’ll use your smartphone’s video feature to talk about products and brands, giving your honest opinions. You can make an average of $100 per video chat! Plus, you can earn money from your referrals’ video chats. YouGov – Voice your opinions on social, economic, and political issues with YouGov, and redeem your points for a VISA gift card, Amazon gift card, and more. Zap Surveys – This survey app, available for iOS and Android, offers instant payouts to PayPal, and you can get $6 from taking your first survey! i-Say (review) – Ispos i-Say, a popular surveying company, has a mobile app that lets you take surveys wherever you are. You can earn gift cards and other rewards. These apps are specifically for use with grocery stores and other retail stores. They’ll provide you with cash back opportunities for the items you purchase, or extra discounts off items you need. BerryCart – If you shop for healthy, organic foods, BerryCart will give you cash back on wholesome foods in your local grocery stores. Take a photo of your receipt with the required products and BerryCart pays you within 24 hours. BevRage – BevRage gives you cash back on alcohol, like beer and wine, in stores, bars, or restaurants near you. Checkout51 – Search Checkout51 for items you’d like to purchase at your local grocery store, purchase the products, and you’ll receive cash back for qualifying purchases. Fetch Rewards – Scan your grocery receipts with Fetch Rewards, and it does all the hard work for you to find advertised offers and give you the rebates for them. Groupon Snap –Snap has tons of cash back offers and high discounts for the stores you love to shop at. Ibotta (review) – Ibotta works similarly to Checkout51, and has a wide range of products to choose from. You can also link your loyalty accounts for different stores for added savings with the app. JingIt (review) – Scan your grocery receipts with participating products purchased, and you’ll receive cash back. You can also earn extra with paid videos, offering feedback, etc. Makeena – Makeena rewards users for shopping organic and socially-conscious. Buy these types of items from partnered retailers and you’ll earn money for your account! MobiSave – MobiSave offers cash back on specific grocery items, no matter where you shop. You just have to have an itemized receipt to qualify, and you’ll get paid in 24 hours. Receipt Pal – Receipt Pal pays you in cash and other rewards for taking photos of your receipts. Receipt Hog – Receipt Hog pays you for snapping photos of your receipts from any store. You can also win prizes and cash from Slots, paid surveys, shopping trips, and more. Saving Star (review) – Tap on the offers you want to purchase in the store through the Saving Star app, and you’ll earn cash back. The app even provides coupons and cash back offers for healthy groceries, like fresh produce. Shopkick – Shopkick pays you to find, and scan, specific items in stores. You can also earn cash back for purchases of specific items, watching videos, checking into a store, and more. Walmart Savings Catcher – Not only can you store all your Walmart receipts on this app for handy reference, but you can also submit them for review. Walmart will check with tons of other retailers to make sure you got the lowest price at Walmart for all your qualifying items. If not, you’ll earn the difference, which you can turn into a Walmart gift card. These apps fall in a broader category of shopping apps. They earn you money for a variety of tasks related to shopping, including shopping online! Swagbucks – Swagbucks isn’t just for getting rewarded for online tasks – it’s also an awesome cash back shopping portal. Earn SBs on your purchases from the portal and redeem them for one of Swagbucks’ many gift card options. Ebates (review) – Ebates provides cash back for shopping at your favorite retailers, usually in the form of a percentage of your purchase. BeFrugal – Use the BeFrugal app to shop online, clicking links to the retailers you want to shop with. You’ll earn cash back, which you can redeem for gift cards, PayPal cash, and more. Dosh – Link your debit and credit cards to Dosh to earn cash back whenever you make a purchase with them. You’ll also get $5 for everyone you refer to the app! Drop – The Drop app lets you connect your credit and debit cards to it. When you shop using those cards with any partnered retailer, you’ll earn cash back and bonuses. Loot – Loot pays you to share your new purchases from your favorite brands. For example, take a photo of a new shirt you love, share it with others, and earn money. Paribus (review) (Only available for iOS)– Connect your e-mail inbox to Paribus and the app works to find out if you’re eligible for lower prices based on your recent purchases. If so, it’ll send you your cash back via the app. Punchcard – Punchcard gives you “punches” for shopping your favorite retailers, which you can then redeem for rewards, like Amazon gift cards. Qmee – With Qmee, you can find discounts from several retailers, or product recommendations, based on what you’re searching for. Use Qmee to shop and earn cash back on your purchases. Quidco – Quidco is another cash back shopping app, but this one’s for UK users! Shelfie – Take photos of out-of-stock items at local grocery stories, and you can earn coupons or gift cards. Shopmium – Shopmium offers daily discounts, coupons, and freebies for grocery items, and pays cash back when you purchase certain items and scan your receipt. TopCashback – Another cash back shopping site and app, TopCashback has some of the highest-paying offers you’ll find for your favorite retailers. Walmart Savings Catcher (review)– Not only can you store all your Walmart receipts on this app for handy reference, but you can also submit them for review. Yaarlo – Earn cash back for shopping in-store or online at tons of retailers. You can redeem your earnings for gift cards or PayPal cash. These apps will pay you to have a meal at your favorite restaurants, usually in the form of discounts and coupons, just for being a loyal customer! Applebee’s App – Order your meals using the Applebee’s app, for in-house dining or takeout, and you’ll also be eligible for exclusive discounts for app users. Burger King App – The Burger King app not only lets you use its mobile ordering service for several locations, but you’ll also find exclusive mobile coupons and rewards just for using it. Jamba Juice App – Earn and track rewards using the Jamba Juice app, and you might score some free products! Krispy Kreme Rewards – The Krispy Kreme Rewards program helps you earn free donuts and other goodies when you make purchases with the app. McDonald’s App – Learn all about the latest deals, sweepstakes, contests, and more from your favorite fast food restaurant when you download the app, which you can also use for convenient mobile ordering. My Pretzel Perks from Auntie Anne’s – Earn points toward FREE pretzels every time you make a purchase using your Auntie Anne’s app! Panera Bread App – The Panera Bread app lets you order conveniently through it to help you skip lines in the restaurant, but you can also get exclusive offers and learn more about the menu and its nutrition. Rita’s Rewards – Use this app to track your purchases from Rita’s Italian Ice to help you earn free stuff on future visits. SONIC App – Earn free stuff when you make SONIC purchases with its app and get access to exclusive deals. Texas Roadhouse App – You can get a free appetizer just for downloading the Texas Roadhouse app, which also lets you pay with your phone and complete mobile ordering. WAWA App – Order and pay for your food with the WAWA app and earn rewards for your purchases as a loyal customer. These apps are also different than the other shopping apps, although they all relate to shopping. These apps will have you complete small tasks, like visiting a store and taking a photo of a display or promotion, or providing feedback on a specific store or promotion as a mystery shopper. Easy Shift – Easy Shift gives you tasks that you can complete around your neighborhood, like visiting a store and taking a picture of the outside, or checking prices of items. Payments are usually sent within 48 hours of approval via PayPal. Field Agent (review) – “Jobs” will come up near you on the Field Agent app, like taking a photo of an in-store promotional display. Choose what you want to do, but you’ll have only 2 hours to complete the job. Most jobs pay between $3 and $12, and you can cash out with PayPayl. Gigwalk – Apply for available gigs on Gigwalk, which range from quick tasks to ones that may take a few hours. Some tasks will pay over $100! Once a gig is approved, you’ll get paid automatically with PayPal. Mobee – Mobee gives you free money to complete mystery shopping tasks at a variety of locations near you. Most tasks require answering a series of questions once you’re in the store. Most approvals happen in about 24 hours after completion. Observa – Observa pays you to go to retailers and answer questions that the retailers want to know. Most tasks pay between $4 and $12, and take about 10 to 15 minutes. You’ll get paid immediately with PayPal upon acceptance of your completed task. Rewardable – Rewardable offers a number of ways to get money, but one of its most popular ways is providing feedback on retail stores. Shopalong – Shopalong pays you for your everyday shopping tasks. Scan your receipts, take photos of items, and more, to earn real cash. Survey Merchandiser – Survey’s Merchandiser app pays you to visit stores and participate in demos, audits, or other tasks. You can make up to $150 per day! If you like watching TV, you’re in luck, because these apps will pay you for doing just that! AppTrailers – You can get paid to watch trailers of new apps, and you don’t even have to download them! You’ll earn Reward Points, which you can trade in for PayPal cash. Perk TV – Watch commercials and videos through the app, and you’ll earn points. Trade them in for gift cards from Amazon, Walmart, and more. Nadamobile – Nadamobile gives you reward points to watch its videos from advertisers. You can trade them in for a variety of gift cards. Swagbucks Watch (review) – Swagbucks Watch is an app that lets you earn Swagbucks for watching videos, just like you would on the website. Link your account and watch your SB pile up, which you can then redeem for PayPal cash and other gift cards. Viggle (review)– Viggle is one of the most popular streaming apps that lets you earn points for watching TV. Check into your favorite shows, and earn more points the longer you watch. You can trade in your points for one of over 800 gift cards. Or, opt for cash by transferring your earnings to Perk Plastik. These apps will pay you to exercise, track your fitness goals, and more! DietBet – DietBet lets you bet with others on weight loss goals, and you can win money for meeting your goals. Healthy Wage – Make personal weight loss challenges, or join group challenges (even with your co-workers!) to earn cash for meeting weight loss goals. Pact – Pact lets you earn money by making weight loss or healthy eating goals and sticking to them. Each week, you can make a new Pact, and cash in if you reach it. If you have clothing or other items just sitting around your home not getting used, you can use these apps to sell them right from your smartphone. Bookscouter – Have used textbooks that you no longer need? Sell them through the Bookscouter app, which helps you compare prices of several buyback vendors to find the best one to sell to. You don’t even have to pay for shipping. Carousell – List items you want to sell on the Carousell app. You can also search local groups to sell items within your neighborhood. Close5 – Close5 is similar to Carousell, allowing you to sell your unneeded items to others near you looking for what you’re selling. Gone – Gone helps you sell your used electronics by finding you the best marketplace to sell them in. Upload your electronics, and Gone will find the best place for you to sell it to. It even sends you the necessary shipping items and label. Mercari – Sell safely and securely through the Mercari app. Simply upload photos of your items, and Mercari users will be able to find, and purchase, your items. Poshmark – You can quickly and easily upload your clothes you want to sell to the Poshmark app, and listing them is completely free. Tradesy – You can sell your used designer fashion and accessories with Tradesy. The app will send you shipping materials once you sell your items, and takes care of any necessary returns. Vinted – Vinted is another app that lets you easily sell the clothes you no longer need, right through the app. You can also add video listings for buyers to see a 360-degree view of your items. These apps will pay you just to interact with your phone. You can watch ads that come up on your lock screen, or unlock your phone, to cash in! Adme – Adme adds advertisements to your phone’s lock screen or front screen, and pays you to view them. The app will also display trending content to view for cash, as well as pay you for completing other small tasks with your phone. Fronto – (no longer available) Fronto puts coupons, new app recommendations, trending stories, and more, right on your front screen. Whenever you swipe the content, you’ll receive rewards, which you can redeem for PayPal cash or other prizes. Locket (review) (Only for Google Play)– Locket figures out your interests, based on what you do every day with your phone. Then, it uses the information to personalize your phone screen, and pays you to unlock your phone and interact with the content. Perk Screen – Win points toward prizes just by unlocking your phone with the Perk app, which delivers sponsored products, apps, and more to your phone. ScreenPay (Only for Google Play)– ScreenPay gives you personalized discounts and coupons to your phone based on your interests. Plus, you can earn cash by referring friends, and you’ll earn more when they do. Slidejoy – Slidejoy is an intelligent lock screen app that pays you to keep its trending stories and advertisements on your phone. You can redeem your earnings with PayPal. If you love downloading new smartphone apps, you’re in luck. These apps will pay you to download, and try out, other apps. AppBounty – Earn credits for downloading other apps through AppBounty, and you can redeem them for a variety of different gift cards. AppKarma – Complete offers from other apps, such as downloading or playing an app, and you can redeem your points for gift cards or PayPal cash. Elusive Stars – Get paid to test apps! Once you select an offer through Elusive Stars, you have 24 hours to test and review the app, and you’ll get paid for your feedback. FeaturePoints – Download and try apps through FeaturePoints, and the app will pay you with gift cards or PayPal cash. Free My Apps – You can choose from over 50 gift cards as rewards, like Amazon or iTunes, just for trying out new apps. TapCash Rewards – Download free apps and games to earn credits, which you can trade for PayPal cash or other gift cards. Mobile phone photographers will love these apps, which pay you money for using your smartphone camera. Clashot – Upload your best photos to the Clashot app, and clients using the app can buy them! You’ll earn commission on every photo sold. Foap (review) – You can sell your photos on the Foap marketplace, or participate in missions for specific types of photos. Iconzoomer – Iconzoomer sends its users specific assignments relating to photos you can snap with your smartphone. Upload your photo and receive money. Scoopr – Scoopr is all about brands, and you can help drive buzz to your favorite brands by participating in their photo missions or submitting selfies with your favorite products. You’ll earn cash or brand rewards from doing so. Snapwire – Snapwire customers will pay for the photos you upload to the app. They can request specific shots from their favorite photographers (which could be you! ), or search the database to find your photos. Stockimo – Stockimo is a mobile stock photo app, which lets you sell your favorite photos easily to those in search of beautiful stock photos. You can get paid by tutoring English Language Leaners with these apps. NiceTalk – NiceTalk pays you to speak with Chinese students learning English as a second language. Palfish – You can tutor English language learners through Palfish, and even set your own prices to do so. These apps fall into a category all their own, but still pay you cash for various tasks. ESPN Streak for the Cash – The popular ESPN game is available as an app for your smartphone. Compete against others to have the most correct guesses in daily lists of sports matchups, and win cash! FreeEats – Read texts from advertisers through the FreeEats app, and earn 25 cents or more for each text. You also get $1 when you join. Nielsen Mobile Panel – Nielsen Mobile Panel pays you to let the app run in the background of your smartphone. It will track your location, activities, and more, to get an understanding of what you do with your phone each day. You can earn points to trade for gift cards and other prizes. Qriket – Qriket is a simple spin-the-wheel app that gives you a chance to win cash prizes every day. Servy – Visit your favorite restaurants and provide feedback about your experiences to Servy, which will pay you for your time in cash. Smart Panel – Provide feedback on websites, apps, and technology companies with Smart Panel. You’ll get $5 for qualifying for the app, and $5 for every month you keep it installed. Plus, it pays you loyalty bonuses every 3 months. VOIQ – VOIQ is a virtual call center app that lets you provide call center services to a variety of clients using your smartphone. Have Fun Making Money – But Be Careful! There are likely tons of other apps on the app stores that will claim to give you free money, but they don’t always follow through. Unfortunately, tons of apps that look like those on this list exist, but end up being scams. Protect yourself by reading reviews on the app stores! It’s usually easy to tell real users from fake, spam reviews. Those who have actually tried the app will have no problem being honest in their reviews. The apps on this list really do make you money, but be careful when trying out others. If you’ve used other legit, money-making smartphone apps that we didn’t include, feel free to share them with us! Hello my name is Rose, I have been using this app called gift cards for some time now,and it says once you have reached $100.00 you can either be paid via PayPal and cash out or select a $100.00 gift card. I was just about to reach my 100 points when the app suddenly stopped working and would not not let me sign in the app anymore to collect my winnings.